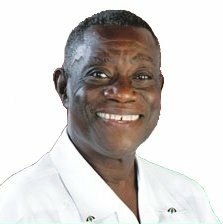 Ghanaian president John Evans Atta Mills, who led the ruling National Democratic Congress (NDC), died this week after a long struggle with throat cancer. Ghana is one of the few countries in West Africa that is a democracy; and not only is it a democracy, but in addition it has political parties that follow internal rules and hold primaries to select candidates to a much greater extent than those in, say, Senegal. This, despite the fact that Senegal, unlike Ghana, has a longer history of voting and party politics under colonialism, thirteen more years of experience with party politics after independence, and no history of military rule. Of course, analysts of Ghana and its political success story are now asking: what will the death of Atta Mills mean for the stability of Ghana’s party system? Will his death create dynamics that change Ghana’s reputation for strong political parties that do not easily fragment? Most Ghana experts appearing in the international media seem to think not. For instance, members of Ghana’s Center for Democratic Development have predicted that Mills’ death will encourage the NDC party to pull together and overcome the internal struggles that the party experienced before Atta Mills became the party’s official candidate for the December 2012 presidential election. But in comparative perspective, the death of African president-party leaders usually creates barriers to party cohesion. If parties in this situation retain their cohesion, it is not because of, but in spite of the confusion and strife generated within the political system after the president’s passing. After the death of Zambian president Levy Mwanawasa in 2008, the ruling party–the Movement for Multiparty Democracy (MMD)–was required to hold a by-election for Mwanawasa’s successor. As Nic Cheeseman notes in African Affairs, “Mwanawasa’s death was followed by a mixture of national mourning, factional realignment, and political uncertainty that was only partially resolved by the narrow victory of the ruling MMD.” The MMD leadership ended up designating a candidate around which they agreed to coordinate, but only with great difficulty. In Gabon, after President Omar Bongo Ondimba passed away in 2009, his son Ali was already the Vice President of the ruling Parti Démocratique Gabonais (PDG). Ali Bongo’s succession as party leader was technically blocked at the time; Ali was part of a faction of “renovators” within the PDG that, despite Ali’s connections to the youth movement and key ministers who were members of the party, could not attain the party presidency behind the closed doors of the PDG committee of around twenty people, charged with finding the party’s successor “by consensus.” However, the PDG old guard, who had supported Ali’s father for decades, supported Ali in the succession crisis, and the PDG publicly announced Ali as its candidate. This was not without major political fallout within the ruling party, which won the election through reliance on electoral fraud. Ali’s clash for inheriting the leadership of the PDG with his close friend (and his father’s “spiritual guide”), André Mba Obame, led the latter to leave the PDG and create his own political party after running against Ali. Obame’s party was short-lived; it dissolved in 2011. Other PDG leaders, from the same Fang ethnicity as Obame, quit the PDG after the internal “consensus” was achieved. One renovator who left the party publicly announced that Ali had come in fourth place for the presidential candidacy within the PDG, but democratic rules were so lacking that he still won the position. In Zambia and Gabon, party cohesion was precarious in the wake of the president’s death, but ruling party personnel relied upon different tools to determine the successor. It appears that Zambia’s MMD relied to a greater extent upon formal, internal party elections than Gabon’s PDG. This is unsurprising, since Zambia is closer to qualifying as a democracy than Gabon, where political power had not changed hands for over 40 years before Ali Bongo. This comparison also lends itself to a hypothesis: that in the context of presidential death, the more a political party relies on democratic internal rules to select candidates, the more cohesive the party will be, and the fewer defections it will experience in moments of crisis. If this is correct, then Ghana in 2012 may indeed experience a rally-around-the-NDC effect after Mills’ death, because it holds democratic primaries. The logic would then be that Mills’ death will create new opportunities within the NDC that will lure the Rawlings family back into party ranks. And NDC members’ desire to pull together in a moment of tragedy will change the Rawlings’ initial decision to leave the NDC to run against its candidate in the presidential election. However, even if this is the case, it is perhaps too optimistic to imply that party cohesion will be easy to attain. Ensuring the cohesion of the NDC, and preventing the Rawlings’ launch of their new party, will be hard work. For even when ruling party leaders are alive and oversee a succession within their organization, this at best creates rifts within the party. Abdou Diouf’s designation of Ousmane Tanor Dieng as the new Socialist Party leader in Senegal set the stage for several dramatic exits (namely, those of Djibo Kâ and Moustapha Niasse, who both founded parliamentary parties that are still important today), and (as Cheeseman notes) Daniel Arap Moi’s designation of Uhuru Kenyatta as successor within the Kenya African National Union in 2002 was later followed by defections from KANU personalities like Raila Odinga, whose Rainbow movement was the driving force behind the Liberal Democratic Party, and who later formed the Orange Democratic Movement that competed in the 2007 presidential elections. Moreover, as one of my Ghanaian friends and colleagues has pointed out, the NDC’s cohesion will depend on whether party members decide to retain the country’s new president, John Mahama, as the NDC presidential candidate, or instead opt to hold another primary within the party to select the replacement for Mills in the 2012 race. However, it is hard to tell which scenario would create more potential for party fragmentation. If the party sticks with Mahama without calling a primary, parts of the NDC constituency that prefer another candidate–whether Rawlings or someone else–will be frustrated; but if the party calls a primary, the losers of this procedure will also feel this way. According to existing political science theory (see, for instance, Professor Alejandro Poiré’s Harvard dissertation on Mexico’s Institutional Revolutionary Party), we would expect more party cohesion to result from a new primary, since following the formal election rules already established within the NDC would create more legitimacy for the selected candidate. Perhaps Mahama would win anyway: Patrick Smith, editor of Africa Confidential, cited Mahama’s prospects, remarking that “[he] is young, has a lot of energy, and is very good with the media,” all traits that could prove important to NDC members when choosing a candidate. The Ghana Elections 2012 blog makes an important point related to prospects for NDC cohesion: Ghana’s prior history of military rule resurfaces in today’s multiparty politics in new forms, currently through the wife of the former flight lieutenant/coup leader/president, Jerry Rawlings. When I was in Ghana prior to the past presidential election season, there were discussions within the NDC about whether Rawlings should play a major role in Atta Mills’ 2008 campaign for the presidency, given the fashion in which he initially took power and his subsequent methods of governing Ghana. Ultimately, Rawlings was closely involved in the workings of the Mills campaign, but was less involved during the Mills presidency that followed, mainly because Mills sought to distance Rawlings’ legacy from the NDC party label (for this important distinction, I thank George Ofosu of the Ghana Elections blog). But in this moment of national crisis following Mills’ death, it will be interesting to see whether Rawlings’ strategy changes and his willingness to remain linked to the NDC without enjoying the spotlight declines. Rawlings and his wife are already rumored to have reacted to Mills’ distancing strategy by creating their own, new political party. 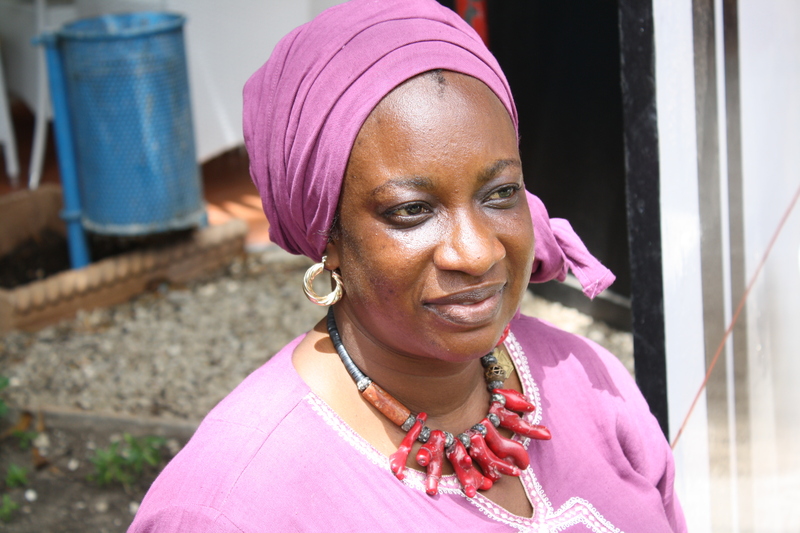 The Rawlings family have displayed clear ambitions to regain a central position in the NDC with Nana Konadu (wife of ex-president Rawlings) competing against Mills in the NDC flag bearer elections last year….prior to the death of Mills [the Rawlings] have been [rumored to have been] in the process of establishing their own party with its inauguration date set for 15th August. Now it remains to be seen whether the NDC will make a final attempt at trying to re-establish an alliance with President Rawlings and his wife or take them on in the December election. Ultimately, the choices that the Rawlings are now pondering (“Should I stay in the NDC, given the new opportunity to fight for the leadership of the party, or should I go, as I had been planning to do before Mills was out of the picture?”) seem much more like those that many Senegalese politicians weighed before founding yet more parties among the hundreds that now exist there. Former Prime Minister Idrissa Seck, for one, founded a party that the government refused to recognize after President Wade threw Seck out of the government and pursued him on corruption charges in the mid-2000s; Seck created the party just prior to the 2007 presidential elections, in which he took second. The broad-based support he was able to mobilize in a short period of time after the party’s founding helped him retain political currency that led to negotiations with Wade in 2009, and a fusion of Seck’s Rewmi party with Wade’s PDS. However, Seck’s departure from the PDS significantly reduced the ruling party ranks, and his re-entry into the PDS five years later created further internal conflicts in a party that was already plagued by personal battles for proximity to Wade. Similar dynamics rippled through the PDS when Wade subsequently removed former Prime Minister Macky Sall in 2008. Sall, who is now President of Senegal, faced the same choices as his predecessor Seck, and ended up founding his own party in reaction to his fall from grace within the ruling party. The “should I stay or should I go” question has also been answered in the “I should go” fashion in Senegal by former barons of the Socialist Party, which ruled Senegal until Abdoulaye Wade came to power in 2000. Both before and after the PS lost in 2000, at least five or six barons chose to leave the mass party and found their own, despite the possible advantages of staying loyal to the PS, with internal structures that were already present and well-developed in all parts of the country, and with representatives already in national government institutions like the National Assembly. The fact that leaving a major party like the NDC is even being pondered by major political figures in Ghana does not bode well for the idea that party cohesion will be by any means easy in the post-Mills context. In Senegal, party discipline is consistently less marked than in Ghana, and internal democracy within political parties is rare if not absent. Ghana going the route of Senegal in terms of individual political ambitions trumping politicians’ commitment to keeping major political parties cohesive is not likely to serve the country well in terms of developing an opposition that has hope of enforcing accountability between politicians and constituents. These cross-country similarities are striking to me because Senegalese parties are not as internally structured as the two major parties in Ghana, which have relatively functional primaries to designate legislative and presidential candidates. The internal procedure that most major parties in Senegal follow is less formal, and depends much more on a single person’s will. When presidential nominations are due, there is little question as to who is in charge of the PDS or the PS and therefore there is little doubt as to who will run. When legislative candidates are in question, the party leader and perhaps a small oligarchy of party personnel have the ultimate say (even if, initially, constituencies designate their desired candidate). In fact, given these major differences between the internal party procedures in Ghana and Senegal, and given that Ghana (unlike Senegal) has election rules that encourage two-party competition at the national level, I find it surprising that the Rawlings have chosen to pursue their ongoing political ambitions by creating their own party, rather than by continuing to battle for control of the NDC from the inside. It will certainly be interesting to see whether Atta Mills’ passing, and the succession process it fosters within the NDC, will push the Rawlings back into the party, or whether Ghana will start traveling the path of countries like Senegal, where party discipline is more difficult to ensure. I thank George Ofosu for enlightening and helpful commentary and criticism of my initial reading of Ghanaian politics that motivated this posting. Please visit the Ghana Elections blog for his nuanced analysis of these recent events and their consequences. I wrote a recently published article on Senegal’s elections, which appears in the current issue of the Journal of Democracy. You can find it at the following, gated link: http://www.journalofdemocracy.org/article/senegal-what-will-turnover-bring. In Dakar, where on any given day you can walk down the street past heaping piles of trash–which eventually get collected but not soon enough–recycling can seem like an activity that is completely out of the question. To my knowledge, there is no program for it organized by the government, even the fairly innovative Mairie de Dakar (the city administration), which has installed working traffic lights throughout the downtown area over the last six months. (Now just to convince the Mairie to stop sending policemen out to the major intersections to direct traffic against the indications provided by the great new lights). In this city, trash is a fixture in the road along with children playing, old men convening, families begging, and vendors selling their wares. In this city, people in suburbia struggle to maintain good health while the government lets untreated wastewater fill the public squares. In this country, the railroad is dangerous in certain places because people have blocked the tracks with their trash. So it is particularly refreshing to stumble upon an artist who is picking up trash and making it into beautiful things. 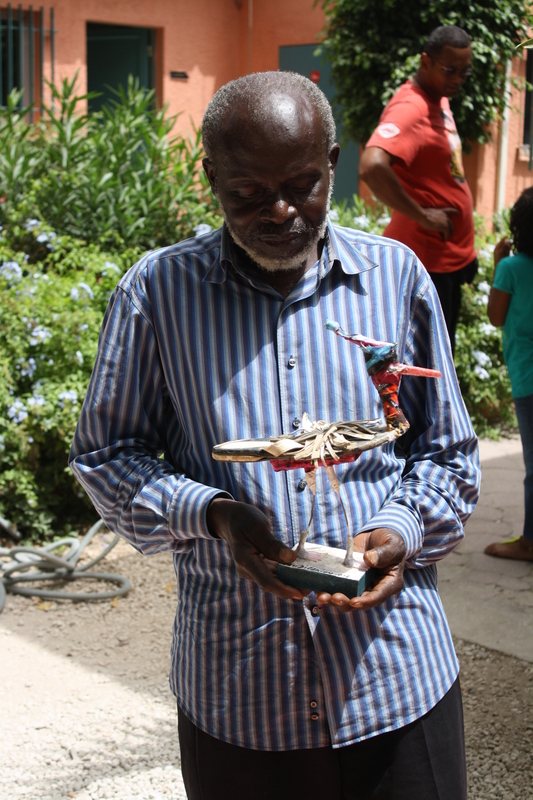 I met Mouhamed Tall Diedhiou by accident, when I walked into Dakar’s Institut Francais one leisurely Saturday. 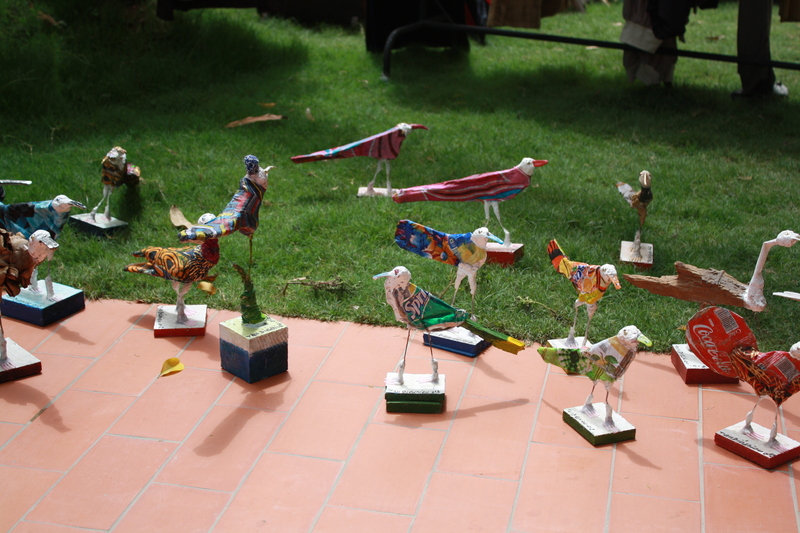 His birds were the quirkiest things on sale at the art market held there several weeks ago. Proof of their distinctiveness was in small children’s reaction to them: when I began browsing, two Lebanese mothers were chasing their three-year-olds around the lawn, grabbing birds out of their chubby hands and begging them to “touch carefully.” These birds were glitzy to people of all ages (or at least to all of us who are preschoolers at heart!). Tall Diedhiou, who makes dozens of birds daily and has filled orders of hundreds at a time from clients in the United States, did not hesitate to get right out there on the lawn with everyone else when I asked for a picture. He’s crazy about birds…and about the trash he uses to make them, as this three-minute documentary will convey much better than I can. Tall Diedhiou is endearing for several reasons. First, his poetic (if not dramatic) way of describing why he chose to mass produce birds, rather than some other animal: “Early in the morning, birds wake up and with their cries and their songs, they let the world know about the victory of light over darkness.” More importantly, his creative use of trash that (as you can’t help but notice in the video) he picks up in the dusty roads around horse-drawn carts and pedestrians in his neighborhood, Parcelles. It makes me feel really guilty for having thrown out two Sprint cellphones last month, after I found out that there is no way they can work in Senegal if you want to give them as a gift because there’s no place for a SIM card. If only I had known, they could have been reincarnated as majestic, darkness-preventing birds. Of course, there are other unsung heroes of recycling in urban Africa. In my neighborhood, the first on my list is Mama, the domestic help at my host family’s compound who has me save every Kirene water bottle I burn through. Bottle collection can be a lucrative enterprise here, as my neighbors who keep warehouses to collect glass bottles can attest. A few blocks away from my apartment and the Sunday morning serenades of people unloading bottles at the warehouse, roadside vendors present their “bargain bins” of bissap flower, bouye, and cure-dents in a Kirene bottle, which they then mark with the price (500 CFA, about $1 USD. Bissap and bouye are used to make local juice, and cure-dents are sticks, chock full of various natural ingredients, that people use as a substitute for brushing their teeth, NOT in the privacy of their own home). As far as recycling goes, let us overstretch our definition, and pay hommage to the taxi drivers whose 15-year-old vehicles (and counting) are still running and (quasi-)appealing to consumers because of the many spare parts that people use without hesitation here when their cab, which should have been trashed long ago, encounters difficulties. The oldest cab my friends and I have found here is one that the driver, Moussa, bought for a couple hundred dollars in 1988, the same year my mid-20s, artsy sisterwas born. The proud driver and his ancient taxi – Photo by Ilya Faibushevich. 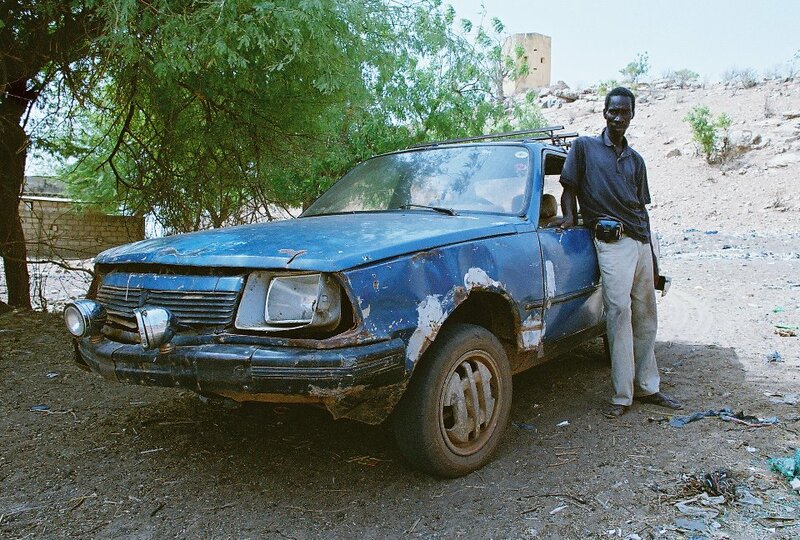 Moussa lives in the Fouta (region that runs along the Senegal river on the Mali and Mauritania border), drove us to dusty colonial outposts, and en route we could literally see the ground moving under us because of holes in the raw metal that is all that remains of his cab. The ladies below do not count as unsung heroes of recycling, but they were both notable presences at the art fair at the Institut Francais the same day I met Tall Diedhiou. There are many ways in which Senegal’s love for Barack Obama is manifested in daily life here. The Barack Obama Senegal Shop is one that I have noticed many times when traveling through the city via taxi. This picture does not show it well, but to the left of the “welcome” sign, there is an additional sign ensuring that we know that the appropriate acronym to use when we talk about this shop is B.O.S.S. Please speak about this in the correct terms when you tell your friends! If you’re looking for Obama regalia, this spot seems to be the place to go, if it is not closed in the middle of the day (as it was when I took this photo). Otherwise, take a trip to the Sandaga Market, where you can procure everything from duffel bags with Obama written along the side in all caps to boxer shorts with Obama printed along the waistband. If you are looking to furnish an apartment with Obama products, you can easily find Obama foam mattresses for sale in the local boutiques in the Medina and Gueule Tapee neighborhoods. And we must not forget the Obama ice cream flavor (I think it is a coffee-ish swirl flavor) at Dakar’s N’Ice Cream shop downtown. (1) Obama is so inspiring to them because he is the son of a Kenyan and he became President of the United States. The fact that Americans have elected an African-American president, my Senegalese friends say, shows that we are open and not discriminatory anymore. One man in a sept-place (shared station wagon) going to Diourbel even went as far as to tell me that racism was no longer a problem in my country. Inevitably, we had a major debate after that statement came out into the open. (2) If we get through the conversation about the overly optimistic views my friends express about the state of American society before I have to get out of the taxi, sometimes drivers will also say that their feelings were a bit hurt when just after his inauguration, Obama visited Ghana but refused to stop in Senegal to see President Abdoulaye Wade. Hopefully, the new president Macky Sall’s government will be more democratic than Wade’s was, and Obama will be able to fly in soon and meet some of these taxi drivers who admire him and the beautiful if unrealistic image he is giving them of America. 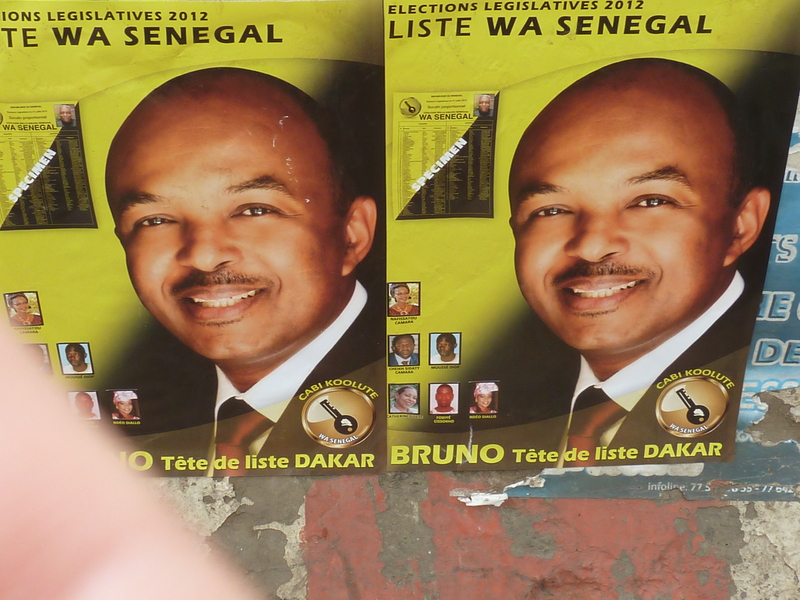 Is Wade really “looming” over Senegal even after losing the presidency? Senegal’s former president, Abdoualye Wade, is not still as powerful as the New York Times would have you think. In yesterday’s “Dakar Journal: In Spirit and In Form, Ousted Titan Keeps a Hold Over Senegal,” Adam Nossiter pointed to several ways in which it may appear that the Senegalese people have not yet overcome their political attachments to their former president. The principal evidence of this continued affinity includes: (1) he is “à la une” (on the front page of the newspapers) every day, and the new president, Macky Sall, cites Wade quite a bit in his media discourse; and (2) he has been a prominent figure in Senegalese politics for over 40 years, and Senegal’s religious leaders (mainly the Sufi marabouts) like him, so why would people stop listening to him now? 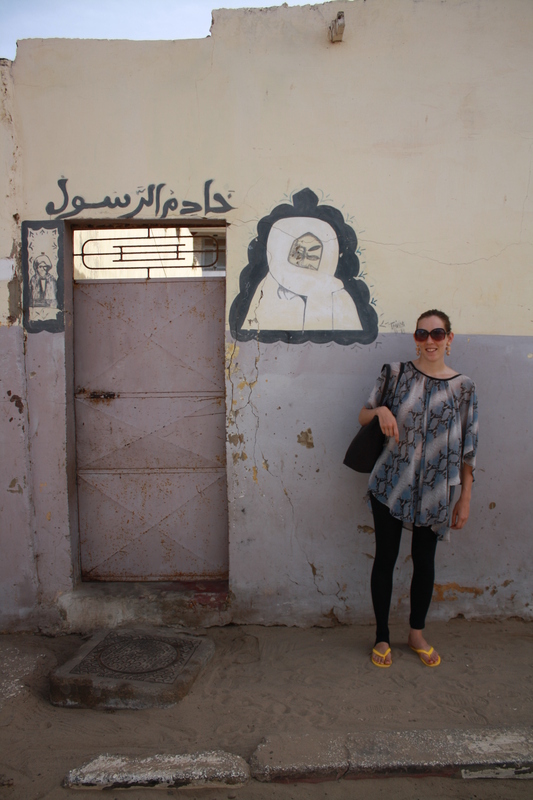 This evidence does not provide a balanced picture of what is going on in post-Wade Senegal. Wade is certainly trying to hold together his party, the PDS, in the wake of his March 2012 defeat in the presidential elections, which were not close; the percentage of votes that Wade won was not over 35% in either the first or the second round of voting. Right now, the media is willing to put Wade front and center. But there are clear indications that Wade’s party is fragmenting (much like the Socialist Party did after its first defeat in 2000). Moreover, Macky Sall has made good on several campaign promises and the marabouts are siding with the new president. Although Wade will certainly remain a political figure that everyone keep tabs on, he does not appear able to follow up on the threats of protest and violence that he made a few weeks ago (“If he [Macky] doesn’t give us back our cars, we will go into the street, and there will be no [legislative] elections.” Wade said this after Sall blocked a fleet of cars that Wade had purchased from passing through customs at the Dakar Port. Wade claimed that the blockage was for political rather than legal reasons). Problematic assertion #1: Wade still dominates the hearts and minds of Senegalese, and we know this because he is on the front page of the Senegalese papers every day and Macky Sall responds to him. The media does indeed still put Wade “front and center in the national political scene,” as Nossiter claims. A recent profile of Abdoulaye Wade in the Senegalese weekly, Nouvel Horizon, also remarks Wade’s comeback as a political opposition figure (My favorite, majestic line of the Nouvel Horizon article is, “All the dissident elements [of the PDS] united to put Wade at the bottom of the political heap in Senegal, and his party too. But look at him being reborn, like a sphinx”). But part of this has to do with the fact that Senegal is currently in the midst of a legislative election campaign, which began earlier this month and will last until voting day on July 1. Wa(llu Askanu) Senegal posters in Dakar. Before Wade’s Senegalese Democratic Party (PDS) launched its formal campaign activities, the former president had been more reticent with the media. While members of the Wade family left Senegal (including the president’s son, Karim, whom the government is trying to track down in order to audit for previous ministerial activities), the 86-year-old Abdoulaye remained in Dakar, tucked away in the ritzy “Point E” neighborhood. Supposedly, he spent the first few weeks after the presidential elections with his spokesperson and former minister, Serigne Mbacké Ndiaye, and did not receive many visitors. Nossiter quotes Ndiaye asserting the population’s continued attraction to Wade in order to argue that Wade continues to “loom over his small but influential country.” But this evidence is not the most reliable, objective source since Ndiaye is now also in Wade’s coalition for the legislative elections. 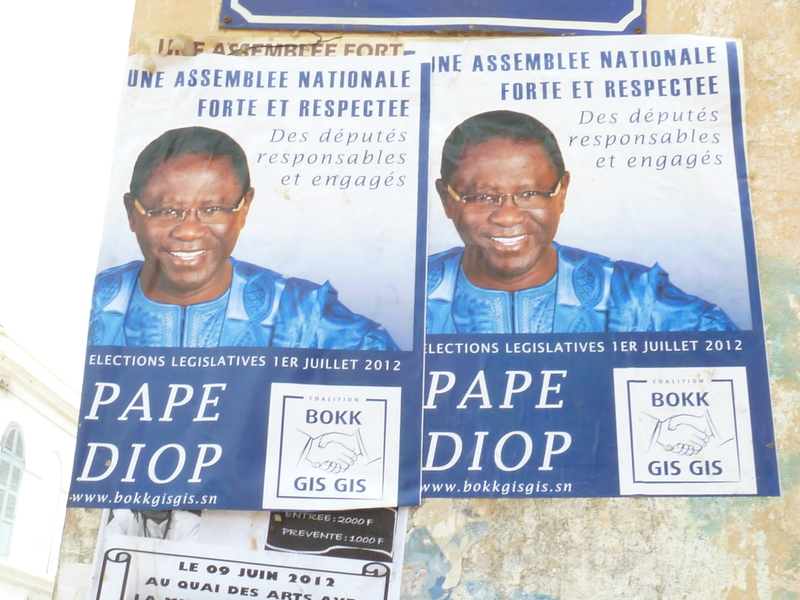 Pape Diop, President of the Senate, in campaign poster form. My photo. As for Sall’s responses: Inevitably, yes, Macky Sall talks about Wade to the media and they seize the day. This does not mean that Sall feels overshadowed by Wade’s presence on the political scene as an opponent. As the Nouvel Horizon article also points out, Sall is constrained in how much he can criticize the previous Wade regime for its corrupt practices. After all, Wade knows Sall’s weaknesses because Sall worked for several years as Wade’s Prime Minister before he was excluded from the PDS. Wade’s political discourse has intensified as Macky Sall’s new Minister of Justice has begun calling former Wade allies to the Division of Criminal Investigation for auditing. However, Sall is not responding to Wade’s polemical discourse merely because he is afraid of his former party boss. Sall has plenty of strategic reasons to distance himself in the public eye from Wade and his governing practices. 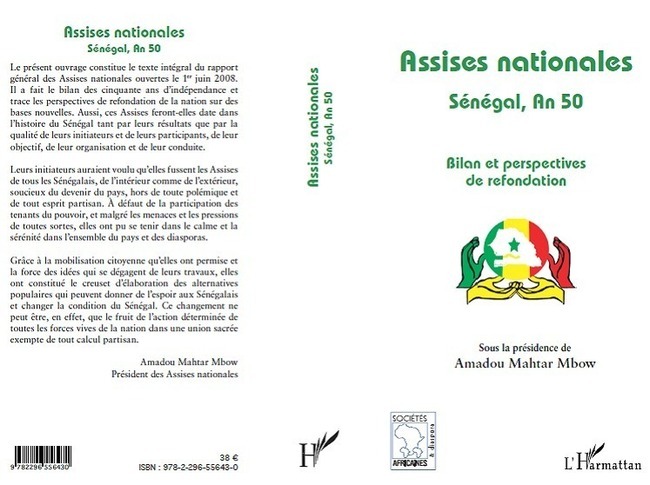 Sall signed the Assises Nationales, which promised citizens less impunity for political elites and more concern for the average citizen’s economic well-being. Macky does not yet know whether or not his coalition, Benno Bokk Yakaar, has a majority in the National Assembly. And given the level of mobilization that citizens exhibited during the presidential campaign, he cannot afford to highlight his past links to Wade, whose pursuit of a third term was the subject of vehement protests in Dakar and in other regional hubs starting a year ago as of this Saturday, June 23. 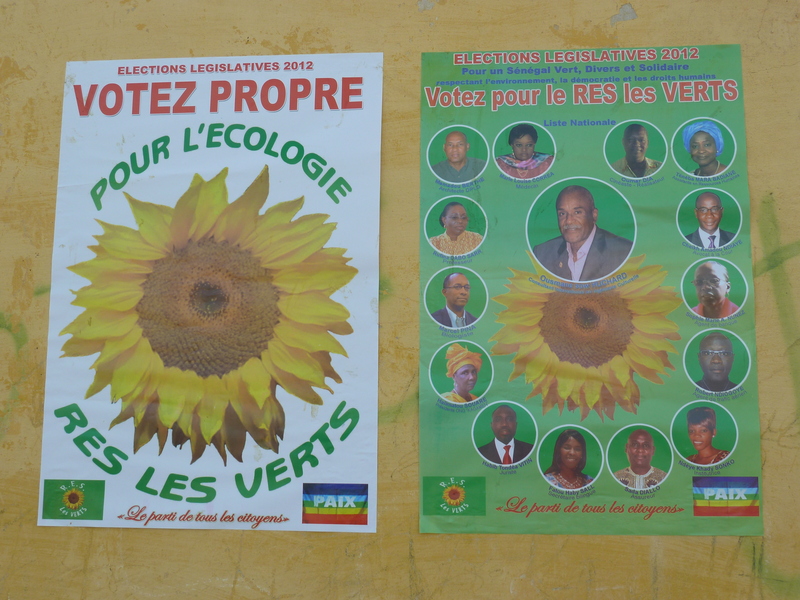 Campaign fliers for RES Les Verts, one of Senegal’s green parties. Although Wade was recently in the news for protesting Sall’s blockage of seven privately owned vehicles he sought to import from Europe, in April he was instead in the papers for having appropriated state vehicles to his political followers and failing to return this state property before leaving the palace for good. Wade’s hands are not entirely clean, even if Sall’s recent blockage of privately purchased vehicles seems more out of line than his earlier attempts to track down state property that Wade had taken. Problematic Assertion #2: Wade has been in politics for so long and has enough support from religious authorities that it is unlikely he will stop being popular now that he is no longer president. Wade was a prominent opponent of the Senegalese regime for 25 years before he won the presidency in 2000. He had given up on politics and was living in France in the years leading up to the 2000 election, and it took the encouragement and partnership of leftist leaders like Abdoulaye Bathily to convince him to run in the election that ended up giving him the presidency after decades of struggle with a quasi-oppressive regime. Without a doubt, he is a major political figure that history will not allow us to forget. But the social science logic of party politics in Africa would have us believe that the strong presidency and corresponding weakness of Senegal’s legislative and judicial branches of government would make Sall immediately more powerful, and therefore more coveted by voters and supporters, than Wade in the post-2012 period. Presidents in most African countries control and dispense state resources, and the smaller the private sector in these countries is, the fewer resources others outside of the president’s entourage have to amass in any attempt to court clientelistic voters (voters who seek gifts, posts, help solving personal problems, or other material forms of assistance) and overcome the party in power. The president has a major resource advantage over all other political contenders. Wade has significant wealth from his career as a professor and lawyer, but mostly from his time as head of state. He can, to a certain extent, build (or retain) a clientelist base of followers to compete with that of Macky Sall. But his means will still be less attractive overall than those of Sall, who has not only a personal fortune (also attained through his time as PM with Wade) but also government funds and government jobs to distribute to retain a base. In the long run, Sall is likely to be the more popular figure, at least according to conventional wisdom in my field. Nossiter quotes a scholar I admire, Mamadou Diouf of Columbia University, in the Times piece: Diouf speaks about the large number of cars that the Wade government owned, rightly saying that “the number of cars the state owns — it’s really pointing at the centrality of resources in the political system. As long as he [Wade] is distributing resources, he will be at the center of the game.” Nossiter’s use of the information, however, is problematic. This quote applies to Wade the President, not to Wade the opponent. It does not support the claim that Wade is still just as powerful as when he was president; instead, Diouf’s statement supports the idea that the new president, Sall, is now the one who has the state power necessary to secure a large following and overpower former presidents like Wade, still trying to hold on to some pieces of the pie. It is also unlikely that Senegalese religious authorities, Sufi marabouts in particular, support Wade more so than other politicians now that he is no longer president. This kind of alliance is not what the historical record would predict. For decades, the “grands marabouts,” leaders at the top of the hierarchy of various Sufi sects, have supported the president and the ruling party (though sometimes more tacitly than others); that is to say, they have either claimed neutrality among candidates or have given holy orders to vote for the party in power. They have not pronounced themselves in favor of opposition figures. It does not seem likely that these alliance patterns will change now that Macky Sall is in office. In fact, just last week, the Khalifa of Leona Niassene, one of Senegal’s two capitals of the Tidjane sect, gave holy orders to his disciples to vote for Sall’s coalition, Benno Bokk Yakaar, in the upcoming legislative elections (Reported in L’Observateur, 16-17 June). We have yet to see if the Mourides, the sect that Wade belongs to, fall clearly into any camp for the upcoming contest. During the presidential, Wade courted the Khalifa General of the Mourides for his support, but the khalifa refused to take sides. Wade’s prospects are even less good for the upcoming legislative elections as an opponent. Perhaps Wade will surprise us, keeping voters with his PDS even if he has not succeeded in keeping important PDS elites (like Senate leader Papa Diop and National Assembly leader Mamadou Seck) with him. Maybe he will live up to Nossiter’s very optimistic expectations. However, it seems more likely that the PDS will not win a majority in the legislative elections, and will face challenges to party cohesion and endurance similar to those under which the Socialist Party ranks greatly diminished after Diouf’s presidential defeat in 2000. Today, the time is ripe to reflect on what Macky Sall’s government has accomplished in the first month (and two days) of its tenure. This afternoon, one of Senegal’s oldest political figures–the 90-year-old Amadou Makhtar Mbow–spoke at the West Africa Research Center, where he launched the most recent publication of the Assises Nationales, a consultation of citizens organized nationwide in 2008 to gather ordinary people’s opinions on Senegal’s social, economic, and political needs. There are many suggestions in the domains of social issues, the diaspora, and foreign policy as well. Ultimately, Sall faced policy demands covered by the Assises as well as many demands unlinked to the Assises Charter. On both fronts, for reasons out of Sall’s control, the first month in office did not begin with ease. After a small inauguration ceremony downtown on April 2, Macky Sall became Senegal’s fourth president. Soon, the papers were reporting that former President Wade had left state coffers empty. The new president managed to secure some interim financing from France, and in the meantime the police began tracking down people from the previous regime who had made off with government vehicles, or had been gifted these vehicles by Wade himself. Rumor has it that for a week or so in April, Sall was traveling around Senegal in the old presidential automobile of Abdou Diouf, Senegal’s second president whom Wade defeated in 2000. *An end to the five-month strike in the education sector, potentially ending the “annee blanche” (wasted school year) in Senegal: The teacher strike ended around a week ago because the teachers in question said that the government seemed to be trying to take on the problem of benefits and salaries. However, they warned that if Macky’s government balked in their ostensible commitment to resolving these issues, they would recommence the strike. Ibrahima Sall, the Education Minister, has been in dialogue with teachers’ unions, trying to figure out how to make the 2011-12 school year complete-able over the summer, so that public high school students do not have to repeat the year they are currently in. * Ending Senegal’s ban on the importation of vehicles over five years old: This was the talk of the town during the presidential campaign. I don’t think any of Wade’s challengers failed to assure citizens that they’d repeal the five-year vehicle rule. * Increased retirement benefits: Just this week, Sall’s government announced that it will increase pensions by 10% for all retired public employees. * The President’s “declaration de patrimoine.” According to Article 37 of the Constitution, each President must document his personal wealth before taking on his duties as head of state. Today, Sall publicized his declaration, which includes a house in Dakar’s ritzy Mermoz neighborhood, an apartment in Houston, Texas, and two vehicles. Kudos to Macky for declaring; Abdoulaye Wade also did when he was elected. However, Wade claimed that the Constitution in place when he took office did not require it, and hence he did not declare his assets at the beginning of his term in 2000. Instead, he did it in 2001. This did not stop some of Wade’s PDS supporters from chiding Macky for not declaring his wealth before taking office. Even now that Macky has made his declaration public, he is being criticized for it: anonymous sources told Seneweb that the declaration was not accurate, and that he has hidden bank accounts overseas, for instance. Regardless of the veracity of these claims, Macky seems to be starting down the right path by following the constitutional requirement. Critics of Macky Sall’s government point out that despite these advances, the President has not done enough to implement institutional reforms that are central to the Assises. For instance, sources say that Sall does not intend to resign as head of his political party now that he is President. He has plans in the works for reducing the presidential control over the Constitutional Court (which, not so incidentally, helped enable Wade to run for a third term despite the Constitution’s two-term limit), but has not yet implemented them. Other critics claim that food prices–which declined recently, as promised–did not decline significantly enough, and that the price reduction hurts small businesses that sell food staples, rather than the large-scale food importers. Finally, there are Senegalese who question whether Sall has clean hands (see the above reference to Sall’s declaration de patrimoine) and is therefore fully equipped to pursue the fight against corruption that he has started, especially after the May 4 Council of Ministers meeting at the Presidential Palace. Macky Sall does not have an easy job right now, given these challenges. His job seems even more difficult when we then take into account that he is preparing his coalition and his fledgling political party for the upcoming, July 1 legislative elections. Lists of candidates have begun to appear in the papers, and the official campaign season begins in a week. I’ll get back to you with another state of the union analysis after that!